PLANTING: Year round planting of transplants or root divisions. SPREAD: 36 to 48 inches or more. BLOOM/FRUIT: Bell-shaped flowers in several colors. GROWTH HABITS/CULTURE: Deep rooted, tough, spreading perennial. Large bristly leaves 8 to 18 inches long, light blue, pink or red bell-like flower spring and summer. Needs ample water but that’s about it. Comfrey is very easy to grow. It will do better in healthy soil and grows best in morning sun and afternoon shade. PROBLEMS: Can be invasive. Roots are tenacious and once established, difficult to dig up. Small pieces will generate new plants. HARVEST/STORAGE: Cut and use leaves anytime. Concentrated tea to use for animal skin problems should be kept refrigerated. CULINARY USES: Should not be used internally. MEDICINAL USES: Topical treatment of rashes, scrapes and especially insect bites and stings. High in vitamins, calcium, phosphorus, potassium, traces and vitamins A&C. Poultice with juice to remove warts and other growths. Can be used as a rinse for skin problems on pets. Infused oil is used to treat arthritis, skin wounds and diseases such as psoriasis. Juice from leaves and stems in a terrific cure for poison ivy. LANDSCAPE USES: Handsome specimen perennial. OTHER USES: Good looking coarse texture perennial for the landscape. Old leaves are excellent for the compost pile. Infused oil is said to make a good anti-wrinkle cosmetic. INSIGHT: USP (U.S. Pharmacopeia) advisory panelists have determined that the internal use of comfrey - a botanical, or plant-based, dietary supplement - can be harmful. Reports of liver damage in humans and animals after the use of comfrey, and the lack of adequate scientific evidence in medical and scientific literature that supports the safe use of comfrey, have prompted USP to issue a negative monograph, discouraging its use. 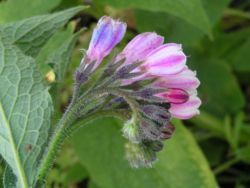 USP emphasizes the dangers of the use of comfrey by children, pregnant or nursing women, and people with liver disease. Medical literature indicates that these people may be especially susceptible to comfrey’s toxic effects. USP also advises that comfrey should not be taken with any other medication or when a serious medical condition is present. The use of topical comfrey on broken skin also should be avoided because of the possibility of systemic absorption. Dr. Judy Griffin says this is a minimal risk, because comfrey is very healing to wounds due to its allantoin content. Studies have reported the development of cancerous liver tumors and liver damage in animals after ingesting or being injected with various amounts of comfrey. 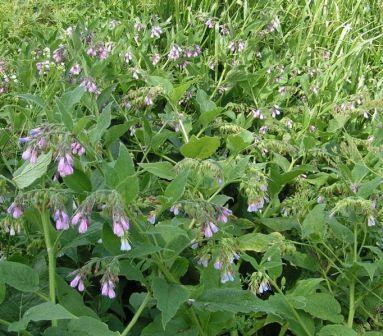 There are also reports of liver damage in humans after oral comfrey use, occurring from long or short-term use (a few weeks to several months) from various amounts and forms (leaves, roots and pills). In other words, comfrey is a very powerful and important herb but shouldn’t be overused. If you haven’t already, it is time to plant all the wonderful and useful herbs like thyme, basil, coriander, chives, begonias, lemongrass, rosemary and oregano. One plant that is very important not to forget is comfrey. It is a beautiful perennial, a natural cure for poison ivy rash and other skin problems. Comfrey is a tough, good-looking perennial herb with large, dark, fuzzy green leaves and beautiful light blue or pink bell-like flowers. It is a beautiful landscape plant, and has some other important uses. When you work around poison ivy, sooner or later you will get a rash. Comfrey is the best cure. Squeeze out some comfrey juice from the stems of the plant and rub it on the rash. It stops the itch and dries up the rash faster and better than the store bought pink stuff. Comfrey juice can be applied topically for insect bites and scrapes and some people use it as a general skin and sore joint treatment. Comfrey is a tough perennial that grows best in partial shade. It is also a very powerful herb that can be used to treat insect bites and stings, poison ivy rash and skin allergies on your pets. For my dog with skin problems, I cook a mess of comfrey leaves and stems, let the dark pot liquor cool and then dilute it down to a light iced tea color, then pour the comfrey tea into the dog’s fur and gently rub down to the skin. Comfrey contains strong alkaloids so don’t use more than once a month and only when needed. Do not take comfrey tea internally or let pets drink. A tea made from the leaves is very soothing to your pets with skin rashes. Do not take internally – it is too strong. Whether you choose to use it medicinally or not, plant comfrey as an ornamental perennial. The independent organic stores have it in stock. Plant some small transplants right now. The best location is morning sun and afternoon shade but will grow in most exposures.